North American Lighting (NAL) will enjoy a higher profile at Indiana State University after the ISU Board of Trustees approved Friday the naming of a student success center in honor of the manufacturer's investment in Sycamores. The College of Technology's new Student Success Center, located on the first floor of the John T. Myers Technology Center, is now the North American Lighting Student Success Center until Oct. 12, 2021. The college's center, which is in its first academic year of operation, is designed to meet students where they are and assist them with both academic and post-graduation success. 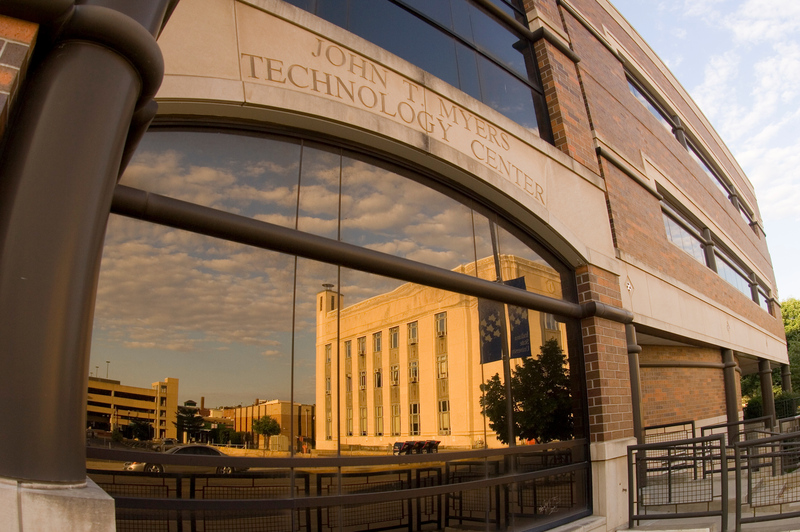 "On behalf of our students, faculty and staff, I appreciate the North American Lighting's support and contribution to the College of Technology at ISU," said Nesli Alp, dean of the College of Technology. "The new student success center is crucial for our students' success, retention and graduation." The college's center brings together its faculty and staff with other campus partners - Center for Student Success, Career Center, University College, financial aid, mentoring programs, etc. - to assist in the academic success of students. "We are so excited about the corporate partnership with NAL," said Kara Harris, associate dean of the College of Technology. "It is both a natural and positive step in continuing to move the college forward in academic and career-ready opportunities for our students." Headquartered in Paris, Ill., NAL is a regular recruiter of Sycamores and currently employs more than 50 alumni, including many in leadership positions. "Partnerships like this are not possible without engaged faculty members like Todd Alberts, who has a history of working with industry to engage our students in experiential learning opportunities," Harris said. "This partnership will allow the college to work more closely with NAL, integrate them more into our experiential learning, and allow our students opportunities to engage with them at an even higher level." Doug Smith, interim vice president for the Division of University Advancement/CEO of ISU Foundation, complimented NAL's strategic decision to tap into Indiana State's intellectual capital. "It's a win for the corporation. It's a win for the university," Smith said. "It gives our students the opportunity to interact with a potential employer, and it gives the company access to a pipeline of talent - and the ability to interact with the faculty. There may be research opportunities for a company and its products with a partnership like this one." As part of the agreement, NAL will provide funding for three consecutive years to support the College of Technology's student success center and sponsorships in athletics and the university's career center. The total three-year commitment is for $75,000, of which $51,000 is for center support. "The partnership demonstrates the quality of our academic programs and the importance of industry partnerships to supplement what we do to ensure student success through strong advising and internships," Smith said. "It's a strategic move on their part and hopefully the beginning of something bigger." • Trustees approved the recommendation to maintain health benefit coverage and rates for 2019 at the current level. "It is extremely rare to have a year where the cost of our health benefits remains stable," said Indiana State President Deborah Curtis. "Our claims haven't declined, but through the prudent decision to switch third-party administrators, we have realized deeper discounts from providers. I would like to commend Senior Vice President Diann McKee and her team for their vigilance in saving the university and its employees from an increase this year." • Trustees approved university officials to request authorization from the state for $1.3 million in campus repairs, including replacing the fire alarm system in the Landini Center for Performing and Fine Arts and replacing the roof on Technology Building A. • The board approved changes to Policy 665 University Naming Policy, which includes more robust approach to the issue. Smith was tasked with reviewing and suggesting modifications to the policy shortly after he started as interim vice president for advancement in January. He drew upon previous experience, best practices and input from Provost Mike Licari, Senior Vice President of Finance Diann McKee and General Counsel Katie Butwin. "It's not uncommon for the university to take a look at a policy and update it every three to five years," Smith said. With regard to this policy, "there are contingencies in today's world that the university needs to address, such as corporate mergers and acquisitions." Other changes include providing approval and removal criteria, adding criteria for non-benefactor/honorific naming; increasing academic endowments to current market conditions; and establishing a naming committee, appointed by the president and chaired by the vice president of university advancement, to review proposed naming opportunities. • Trustees approved an updated Memorandum of Understanding between university and the ISU Foundation following the restructuring and creation of Division of University Advancement this summer. Additionally, the MOU calls for the ISU Board of Trustees and the executive committee of the ISU Foundation will meet annually to plan and share priorities. "It's a positive move that reflects President Curtis' goal to have a true partnership between the university and foundation and to ensure they move as one," Smith said. Friday was Smith's last board of trustees meeting serving as interim. "There are a lot of really great people here," Smith said. "I've always believed in the importance of higher education and helping young people who have worked hard and positioned themselves to achieve excellence." Andrea Angel has been hired to lead University Advancement and will begin her duties Nov. 12. She previously worked as associate vice chancellor for alumni and development at the University of Arkansas-Little Rock. • Trustees approved conferring an honorary doctor of humane letters to Rep. Clyde Kersey (D-Terre Haute) in recognition of his 32-year career in public service at winter commencement. Since his election to the Indiana House of Representatives in 1996, Kersey has represented House District 43, which includes the Indiana State campus. Kersey announced last year he would not seek re-election in 2018. A long-time champion for public higher education, Kersey served most of his legislative career on the House Ways and Means Committee, where he supported several important university priorities including the creation of the Indiana Principal Leadership Institute (2013) and the special legislative appropriation to address nursing shortages (2007). His most notable achievements on behalf of Indiana State include helping secure full state funding for University Hall (2005), as well as funding for Stalker Hall (2001). In 2006, Kersey led a bi-partisan effort to approve the Student Recreation Center (during a non-budget year) that has helped transform the campus. He has also been helpful with the advancement of Federal Hall (2009), Normal Hall (2013), Hulman Center (2015), the College of Health and Human Services (2015) and the Fine Arts and Commerce Building (2017). Kersey, '71, GR '75, and his wife, Susie, '78, forged successful careers as educators in the Terre Haute community. Kersey served on the Vigo County Council, 1987-1996. He is a graduate of Fountainet High School and a veteran of the U.S. Air Force. • Curtis highlighted this year's updates to the university's strategic plan, "There's More to Blue," which runs through 2021. Changes include moving to five goals rather than six (experiential learning is being merged with distinctive learning) with broad-based strategies to allow big-picture thinking, terminology updates and adding qualitative measures to humanize the efforts. The next meeting of the ISU Board of Trustees is set for Dec. 14. North American Lighting (NAL) will enjoy a higher profile at Indiana State University after the ISU Board of Trustees approved Friday the naming of a student success center in honor of the manufacturer’s investment in Sycamores.